Take one minute to step out of clock -time and just look at the picture with open awareness.If your mind wanders bring it back to the picture. Allow the picture to move you from thinking to awareness.What comes into your awareness? I know many people who have no confidence in themselves as learners. Who carry around the idea that they cannot learn like a giant ball and chain. One of the damaging simplifications in the world of education is the dominant concept of the fixed nature of ability. Professor Guy Claxton argues that we all have a learning capacity that can be stretched. The future belongs to the learners… Here is a link to an article by Guy Claxton and Sara Meadows,’Brightening Up: How Children learn to be gifted.’ http://www.guyclaxton.com/documents/GT%20chapter%20final%20_3_.pdf Become like a child again, and relearn your giftedness. 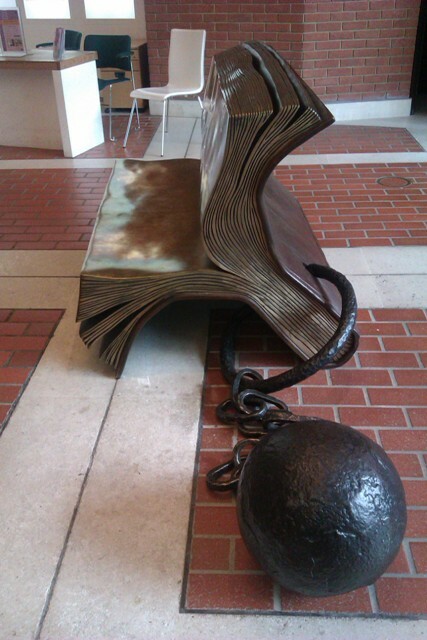 The book/chair (seat of learning?) is set on a crossroads which reminds us that it is our task to decide the direction and duration of our learning. Do I walk away from the immoveable book or having rested in its learning move on in a new direction?